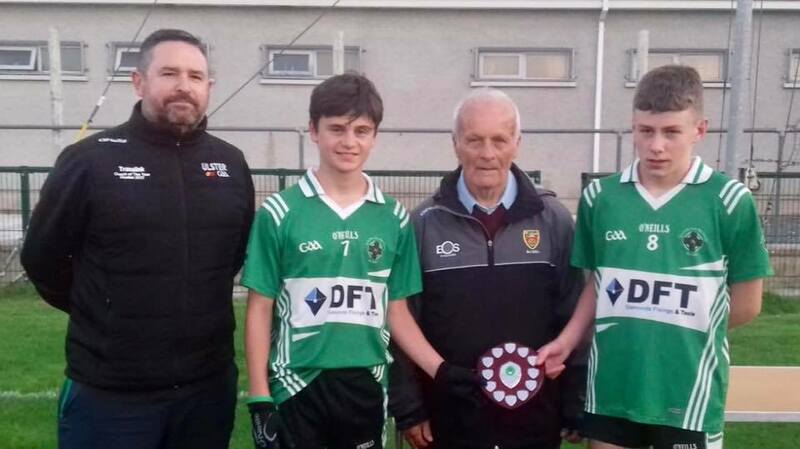 *Our U14’s take pride of place as the team of the season so far as they annexed a first ever East Down U14 league title for the club last Monday evening in front of a large travelling support. The lads saw off a robust challenge from Bright in the league play off hosted by Drumaness. Both teams went through their league programme with only one defeat, both winning their home fixtures against each other and this meant a play off was required to determine the league winners. Bright won the throw in and pointed with 28 seconds gone. Marc Quinn immediately replied for the Fin with a well taken goal. Bright tagged on two points in succession to level the game by the 4th minute. There followed a five minute period of play when neither team scored as both teams were defending well. In the 10th minute Conor Walsh slotted over a point to edge the Fin ahead again. Moments later the Fin keeper Odhran Maguire saved well before Bright eventually got their first goal of the night. Over the next five minutes Quinn smashed in two more goals with Ethan Murray and Walsh getting a point apiece and the Fin led by six points. In the 18th minute Bright hit the net again but Quinn kept his side ahead with two more points from play. In the minutes leading up to half time Bright grabbed a goal and a point to leave it a one point game and all to play for at the short whistle. Half time Aughlisnafin 3-5 V Bright 3-4. Similar to the start of the first half Bright scored straight from winning the throw in. But within seconds Ethan Murray scored the first of his four second half goals. But there was no inkling of the four goals that were to come as Bright scored an unanswered 2-2 to take a five point lead. Murray got a second goal and super points by Niall Dornan and Marty Og Flanagan were negated by two points for Bright as they held a two point lead going into the last 15 minutes of the game. Another goal for the bustling full forward Murray edged the Fin back in front by the minimum. Bright grabbed another 1-1 to take the lead again as the game ebbed and flowed. Quinn then hit two goals in a row to swing the lead back to the Fin by three. It was a thrilling spectacular with both teams giving it their all. Another point for Bright left it a two point game and the Ballynoe side were looking dangerous. Another point for the irrepressible Quinn and a goal from Walsh looked to give the Fin a bit of breathing space but Bright battled to the end with another 2-1 to lead by the minimum with only minutes left. A superb fourth goal for Murray and Quinn capped a fine performance to sail over a free to win the game by three points. Final Score Aughlisnafin 10-09 V Bright 8-12. *Our U14’s will now look to their championship semi final against Dundrum at 2 pm this Saturday at Pairc Baile Anna. Lets get out in support of our lads again. *Our Seniors were in championship action on Monday night in Mayobridge against Newry Mitchels. The seniors are also at home to Teconnaught for their final league game this Friday evening at 6.45 pm. *Our U16’s put in a valiant effort last Thursday evening away to RGU in the East Down U16-A championship. We have been shorn of a few players due to long term injuries in the latter part of the season and in the first half suffered yet another casualty with Rhys Clarke suffering a buckle fracture of his forearm in the latter stages of the first half. Best wishes to Rhys. Despite this it was all square at half time. RGU 0-7 Aughlisnafin 1-4. Ryan Morgan with a beauty of a goal for the Fin. The lads were playing some really smart football and prevented RGU running in for goals as easily as they had done in the most recent league game. *Our U11’s remain top of the league standings after picking up all four points from their fixtures against Bredagh & Carryduff development teams respectively. They will now travel away to Kilclief for their penultimate league fixture at 11 am this Sunday. 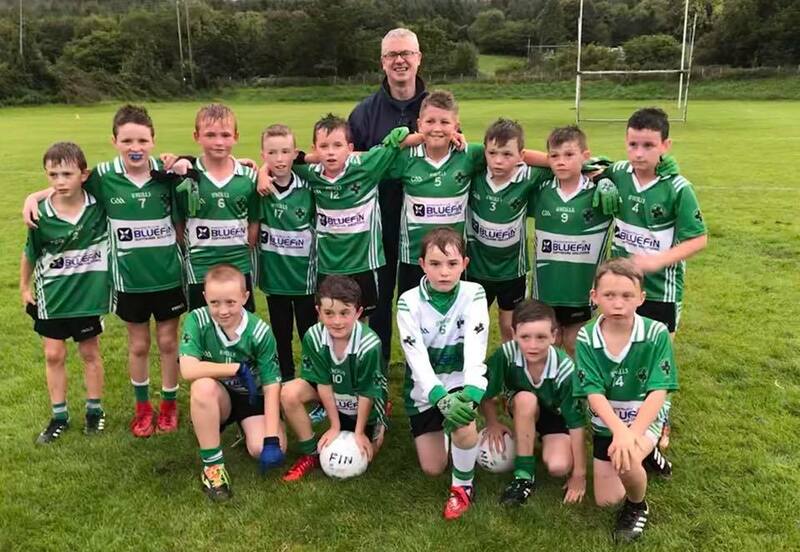 They were delighted to have their photo taken with, none other than, the RTE GAA personality Joe Brolly who congratulated them on their performance against Bredagh and commented on how it was pleasing to see so many of our players kicking off both feet, a skill that we encourage at every level in our club. *The Donard Summit Challenge will be held this Sunday. Contact our club secretary Sheena Murray for details. We are looking for more adult volunteers to take up the challenge. *Our Wild West themed night in Annsborough Club on Saturday 22nd September. Admission is £10, those in fancy dress get a £2 concession. Music by DJ B. Doors open 8.30 pm, late bar. *Lotto numbers 12, 14, 16, 25. No winners. Jackpot £3,750.